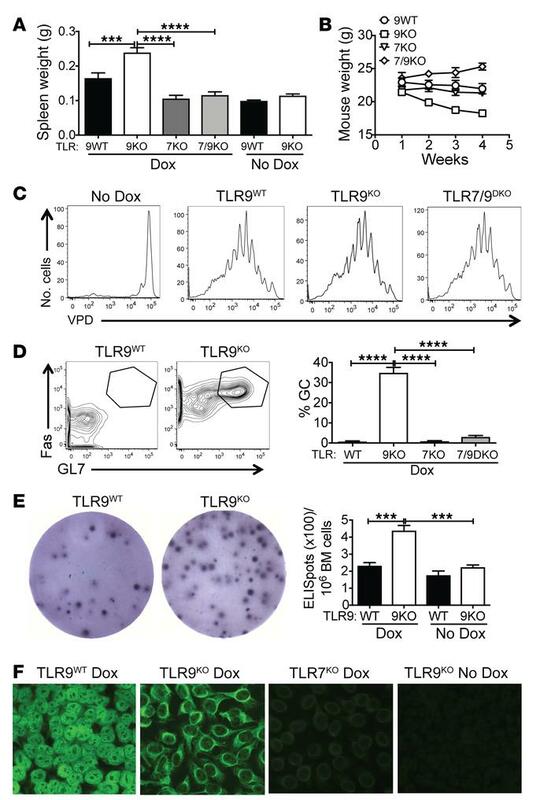 TLR9 deficiency promotes systemic autoimmunity and B cell activation. TLR9 WT, TLR9KO, TLR7KO, and TLR7/9DKO Ii-TGO mice were or were not provided with Dox chow and were sublethally irradiated (400R) and injected i.v. with DO11 T cells. (A and B) Spleen weight (g) at 4 weeks and total body weight (g) at weekly time points following injection. (C) Proliferation of VPD-labeled naive DO11 T cells in sdLNs 5 days after T cell injection (n = 5 per group). (D) B220+ cells from the sdLNs stained for GC markers Fas and GL7. (E) Plasma cells in the bone marrow measured by ELISpot assay at 4 weeks after T cell injection (n = 6 per group). (F) Autoantibodies detected by HEp2 staining. Original magnification, ×200. Images were captured at ×2 magnification using an ImmunoSpot plate reader (CTL), and a representative well image is shown in the figure. Data are shown as mean ± SEM and are representative of 5 independent experiments with n = 20 mice per group (A, B, D, and F). ***P < 0.001; ****P < 0.0001, 1-way ANOVA with Šidák’s multiple-comparison test.